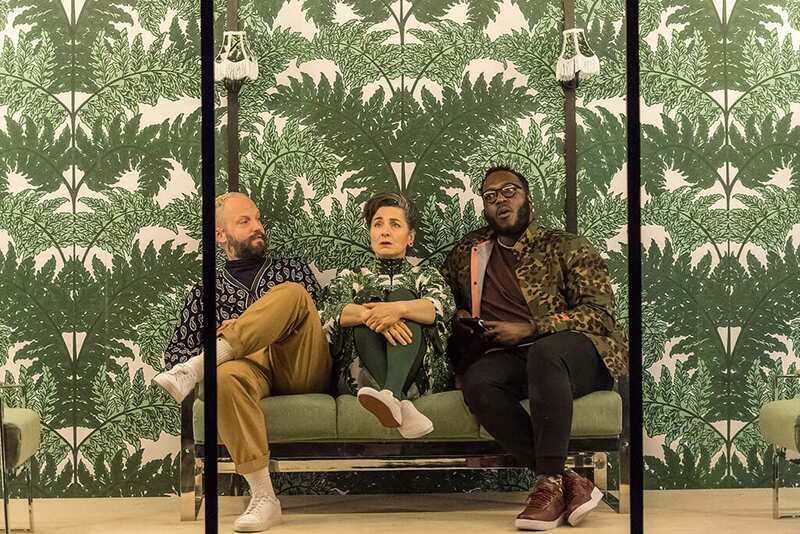 Headlong’s production of George Bernard Shaw’s Pygmalion is obsessed with language; as a method of communication, as a marker of class, as a building block of the world around us. 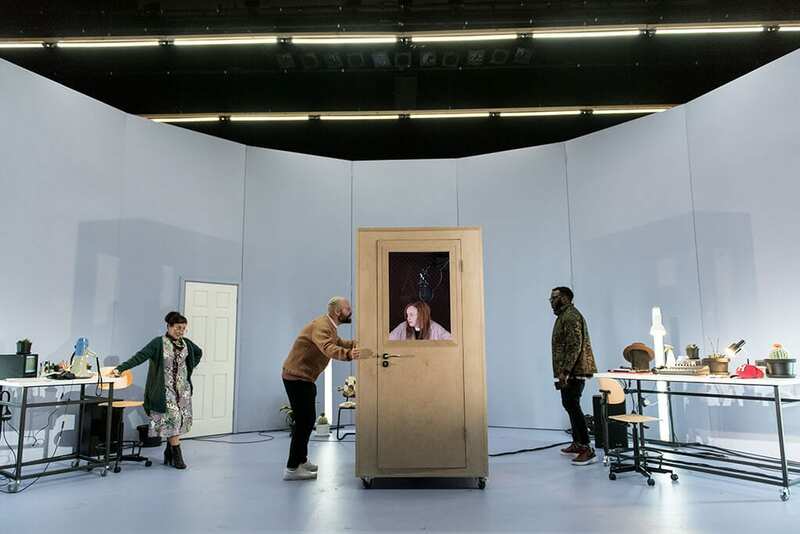 This is clear from the beginning of the performance, as the audience enters we are greeted by the recorded sounds of the actors warming up, repeating vowels and tongue twisters. 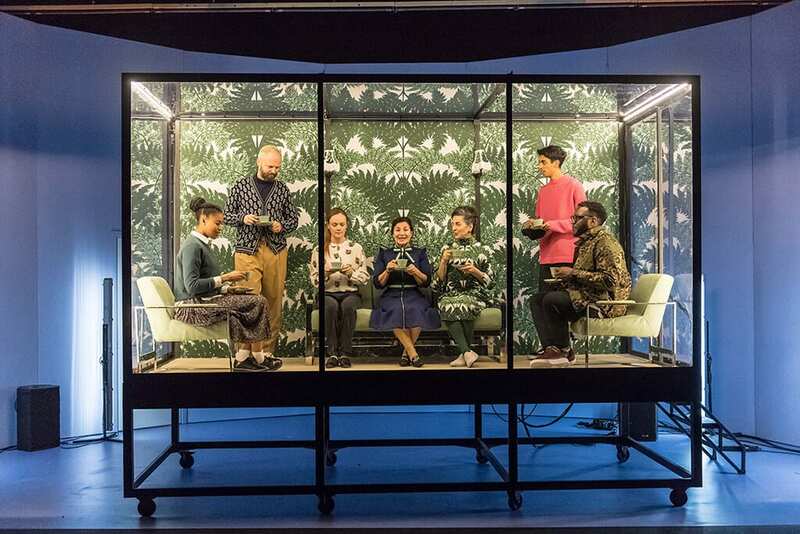 A quote from Bernard Shaw is projected on a loop, ‘Ambitious flower-girls who see this play must not imagine they can pass themselves off as fine ladies’. Through the plywood flat that takes up the entire front of the stage, we can see through a slit into a expansive, white room. The first 15 minutes or first act, as it is described in the program, is completely lip synced by the cast, from recordings of people speaking the lines in their own accents, men read women’s lines and vice versa, a young boy has the voice of an old man, and every so often someone is Australian. The effect is oddly enjoyable, the skill is exciting to watch and the gimmick – though to use such a term is somewhat reductive – proposes interesting questions about identity and acting. As soon as Eliza (a flower girl the two professors attempt to turn into a believable duchess in six months as a bet), Natalie Gavin, enters, she is a spark of authenticity, speaking with her own, thoroughly northern, voice. She is immediately, coarsely, charming. This production is whole heartedly placed in the 21st Century, we are in a world with Kanye and Beyoncé, (the update of Henry Higgins, Alex Beckett, from the Edwardian professor familiar from My Fair Lady to a Shoreditch hipster is particularly enjoyable) and sound equipment litters the stage, Higgins spends his time digitally manipulating speech, to analyse the sound or occasionally to create impromptu hip hop songs. There are also interludes of beautifully shot film as Eliza takes her first taxi, runs through London after her argument with Higgins or, in a sweet reference to the 1938 film, lip syncs Oh Wouldn’t It Be Lovely in her dingy bedsit. The whole production is very aesthetically pleasing, the tea party takes place in a giant glass box, Higgin’s home is stripped back and bare, and the costumes are relevant, editorial, there are none of the trappings of Edwardian society here. 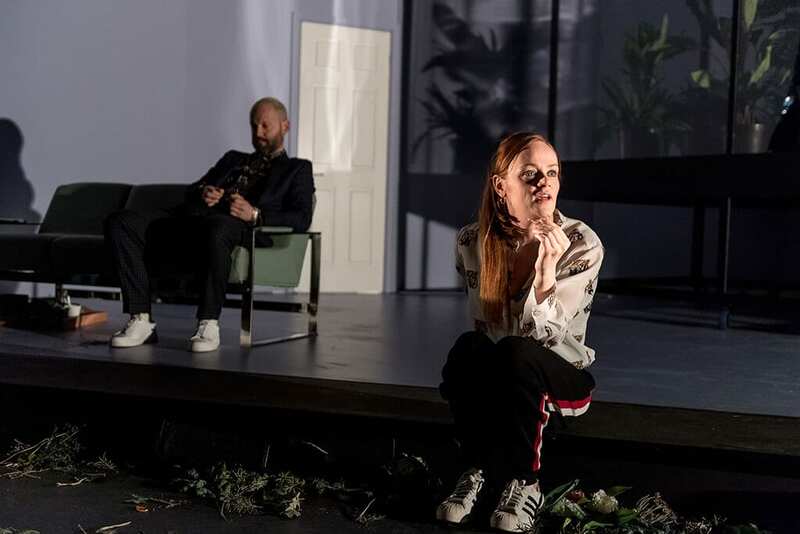 Alex Beckett, as Higgins, is captivating in his gruffness, blunt and surly from the start, it’s easy to see why Eliza feels so dejected after the garden party. However, there are moments of real humanity, his relationship with his mother, Liza Sadavoy, is a joy to behold, sarcastic, biting and perfectly matched. When he allows us, just for a second, to glimpse how deeply he has come to care for Eliza, after she has left him alone, it is all the more heart breaking for his roughness. Beckett and Gavin create a much sadder, more brutal version of the Higgins/Eliza dynamic than audiences may be used to from My Fair Lady. The final scene is utterly captivating, it relies on none of the gimmicks of earlier moments and is better for it, 100 years after its first performance, the ending is as affecting as ever. Cast Includes: Natalie Gavin, Alex Beckett, Ian Burfield and Liza Sadavoy.